A better way to warm up oin the venue or to practice quietly. Needing to practice at odd times and in odd places over the years (and the absence of a suitable mute) was the reason Trevor Bremner designed the sshhmute. 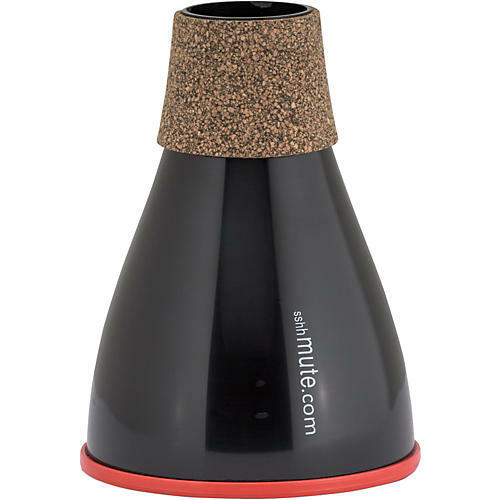 In development over several years in his New Plymouth workshop, the sshhmute is at long last in full commercial production and has been successfully launched to answer a market need for an effective mute in a price range to suit budding musicians and professionals alike. The traditional complaint against practice mutes has been an unnatural level of resistance that makes practice inconsistent and less helpful. That complaint has been addressed and for the most part eliminated with the sshhmute. The sshhmute is made from lightweight, yet hard-wearing, ABS plastic with no parts to break or fall off and it is sold in a convenient soft fabric carry bag. Perhaps one of the primary benefits of the sshhmute design is the very small amount of back-pressure it creates. This allows for better air supply, while still opening and developing the throat muscles. The mute also remains in tune and faithfully accurate throughout the entire range. Gives accurate tuning throughout the range. Helps develop and open the throat muscles to give better air flow, thus improving the tone. Has an improved resistance factor, allowing you to extend practice sessions and enhances pitching and accuracy. Designed to fit into all brands and models of instruments without compromising effectiveness. It is made from lightweight ABS plastic which will not cause your instrument to feel any heavier when playing. Helps you warm up before going on stage. Weighs only 46 grams (about 18% less than traditional metal mutes). Won™t dent if you happen to drop it. It is competitively priced, yet offers more benefits than most other mutes. Order today and solve your quiet practice and warm-up challenges.